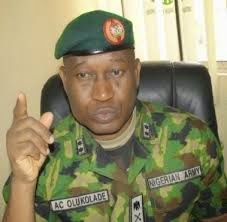 The Director of Defence Information, Major General Chris Olukolade has dismissed Abubakar Shekau’s threat of causing mayhem during the 2015 general elections, giving strong assurances that the military will be able to secure Nigeria during and after the elections. General Olukolade on Wednesday told Channels Television that no amount of threat will deter the military’s operations from taking place in the North East or anywhere in the country. He also said a lot of success has been achieved in the past week, in the fight against insurgence adding that Mongunu and other towns hitherto controlled by Boko Haram have been recovered by the Nigerian Military. Recently, the Nigerian Military took delivery of some military hardware to enable it fight the terrorist to a standstill. In a video posted on Reuters, Abubakar Shekau condemned states government for not following sharia law, and threatened to stop the elections from holding. The presidential election has already been postponed from its initial date of February 14 due to security concerns. According to the video, Abubakar Shekau said “you are claiming that we don’t know how to fight, but we forced your forces to flee from their bases and we freed our imprisoned brothers from the prisons that you oppressed them in, only praise be to Allah”. Shekau’s who titled the video “A Message to the Leaders of the Disbelievers”, also threatened to attack neighbouring countries who are contributing troops to the Multi-National Joint Task Force (MNJTF) like Chad and Niger.